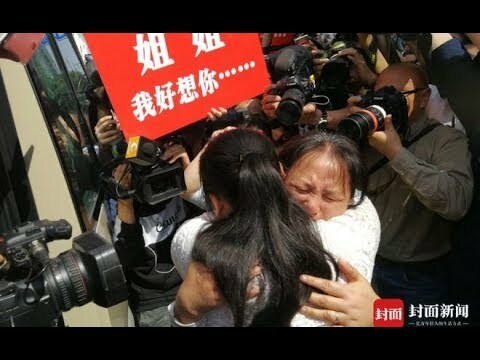 China family find lost daughter after 24-year search. A Chinese man has been reunited with his daughter 24 years after she went missing. Wang Mingqing never gave up the search for his daughter, Qifeng, after she went missing in when she was just three-years-old in the the central city of Chengdu. Mr Wang and wife were selling fruit when they noticed their little girl had gone. He had gone to change money and on his return she was missing. The couple spent years looking for their daughter, regularly taking out advertisements and setting up online appeals, to no avail. Three years ago Mr Wang took up a job as a taxi driver in an attempt to broaden his search, using a sign in his rear window and handing out leaflets to his passengers. The breakthrough came after a police sketch artist produced a drawing of a grown up Qifeng. After it was distributed a woman called Kang Ying saw the picture and thought it resembled her. She had been raised by adoptive parents in a small town 12 miles away, who had reportedly told her that they found her by the side of the road in Chengdu. After she contacted Mr Wang earlier this year, she found that she shared some unusual traits with his missing daughter. She had a small scar on her forehead and a tendency to get nauseous whenever she cried. A positive DNA test confirmed that she was Mr Wang’s long-lost child but details of how she went missing and who she grew up have been revealed. “I can’t tell you how much hope, disappointment and despair we have gone through these past 24 years. Now we can finally meet again,” Mr Wang told the Beijing Youth Daily newspaper.